Are you looking for the most profitable business industries in the UK? So, it’s sure that you’ll like to invest your money in that place, which is safe, secure and have the potential to grow exponentially. The small businesses are with less than 10 workers are planning to grow headcount over the next two years. Those are about 50% in the number. Also, according to the recent Albion Growth report, they’re looking for the expert staff tops the list of challenges business owners face. Usually, these are the cases for some particular industries. These include healthcare and medical, manufacturing and construction. Besides, the industry of food and drinks are growing as one of the fastest growing businesses in the UK. As a result, 11% of the businesses operate in this sector because the industry is the most successful one. 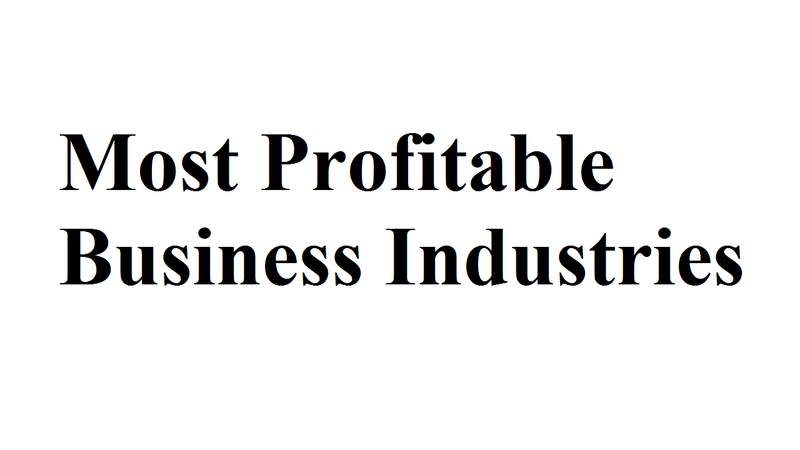 What are the Top 10 Most Profitable Business Industries in the UK? This is a sparkling desire to find out everything the most profitable business industries in the UK to know about which sectors are looking hot right now at the beginning of a new year. According to the research of the Recruitment and Employment Confederation (REC), 67% revenue growth forecasts for the UK business industries in 2018. It was 60% in the last year. This is because many companies will be looking to niche agencies for support with talent attraction strategies. Now, let’s know about the best industries to start a business in the UK. This is accounting services that are by far the most financially sound business investment, according to the study of Sage works in recent. They perform the study of private companies with less than $10 million (£6.4 million) in annual revenues. Fortunately, they found accounting had the best profit margins from a study of 1,000 financial statements from private companies. The sector is going to a new and the most profitable business industries in the UK very soon. According to research by the REC which tells us that 81% of the recruitment agencies surveys think demand will rise significantly, the demand for cybersecurity professionals will increase over 2018. In the last year, 2017, the UK, unfortunately, saw a rise in cyber-related crime. It indicates that there are needs of specialists to deal efficiently with demands in the IT and technology industry. Moreover, there are so many critical skills needed within IT and Technology. This is because it’s getting difficult to find out which candidates are perfect for the jobs. Also, this is one of the fastest growing industries to start a business in the UK. This has only been made more concerning with Brexit looming of a huge skills shortage in the construction industry. It happens because of uncertainty over new commercial projects and infrastructure. Although the future demand for staff for these projects will remain healthy, signifying that investment will return to the construction sector, there are many new projects planned in this running year. Besides, UK businesses are finding it ‘notably harder’ to recruit expert staff as a result of a fall in net migration, according to a report published by the Association of Professional Staffing Companies (APSCo). Financial Technology is one of the most profitable business industries. It’s gradually going to one of the best industries to start a business in the UK. The employers are increasingly relying on contractors as opposed to seeking permanent employees because the demand for niche tech skill sets in Financial Technology is so high. According to a business expert, it’s in the here and now, FinTech disruption isn’t in the future anymore. Besides, the bigger demand clearly highlights through the increase in job vacancies; this industry is set to dominate the UK economy further in 2018. With the study attributing this growth to the weak pound, the new data by the CBI revealed that growth within the manufacturing sector is at a 30 year high. It means that Eurozone economies are placing more orders with UK manufacturers for this year and next as well. In addition, manufacturing enjoyed its best quarter for three and a half years, and this good fortune is expected to continue with manufacturing becoming a Brexit winner in the last year. Besides, the number of manufacturing firms citing a shortage of workers for limiting their investment plans is at its highest for four years, according to the CBI stats. With it brings a huge 75,000 job opportunities and as a legal framework replacing the 1998 Data Protection Act, the new data protection regulations will come into play this May called the GDPR. It’s trying to work out for the Businesses across the UK exactly how the changes will affect them. It’s the help of a GDPR expert that’ll need here as increasing base. This is because; there is continual growth in this industry. Moreover, it’ll need to appoint a Chief Data Manager or a Data Protection Officer for the businesses those processing personal big data. It’s the result of the growth of IT and technology industry. The demand for health professionals is growing rapidly, but there are challenges and uncertainty regarding the IR35. Because of the strain on NHS Trusts the need for temporary nursing and medical staff is a predominant area. This is unlikely to subside in 2018 and increasingly important for recruiters to fill these vacancies. Because of the result of chronic staffing and in a bid to tackle the skills shortage, Health Education England has drafted its first NHS strategy in 25 years. There is a shortage of 42,000 nurses, midwives, and therapists in the healthcare sector. With the government announcing that 2018 is the Year of Engineering, the engineering industry is in the spotlight. So, this is widening the pool of talent for young people to raise awareness and tackle the engineering skills gap. It’s good news for the sector and raises awareness, but this will not be an immediate fix. According to an Engineering Recruiting Director, the number of engineers retiring is outpacing the number of engineers graduating. Also, there are big lacks of the STEM graduates in this industry. It means that the replacement talent pool is extremely undersized. Mining Support is one of the many challenges faced by underground mines has to do with managing more tasks at the same time. You’ll find there five or six principal mining activities that have to be managed in general. Besides, there are maintenance and logistics support activities as the additional work. This is because every action results in a shift demanding people assessment and equipment to perform the activities involved. It’s not only a fastest growing industry but the most profitable industries as well. This is the development industry of the oil and gas field properties and at the last of the business industry list. Here are also different types of jobs for natural gas and crude petroleum. There are the jobs like the production of the mining and extraction of oil from oil shale and oil sands as well as crude petroleum in this subsector. This is because it’s one of the most profitable business industries in the UK as well.